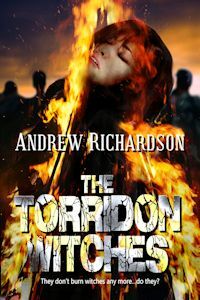 As always, I am delighted to welcome Andrew Richardson to talk about his latest Celtic fantasy release The Footholder's Tale. I had the privilege of reading this book from the first draft and was captivated in the first chapter. The novel has all of Andrew's typical hallmarks: vivid settings, exquisite period detail, and an imaginative rendering of myth and legend. The metaphorical twists begin in the first pages as Math, suffering from his wounds, returns to comfort his former lover during her last days in a bittersweet scene that haunts me to this day--and has inspired me in many romantic scenes I have since written. And at the conclusion of the plot's twists and turns, one's imagination will be captivated by the blend of mysticism and magic in this unique historical romantic fantasy. Math, King of Gwynedd will die without a maiden’s magic to soothe his battle-injured foot. In a court rife with envy, greed and cunning, Math must choose a successor. His nephew falls in obsessive love with the beautiful new Footholder and he and his scheming brother plot to win her and at the same time ruin her – a plan which could mean the King’s death. Will the maiden’s bonding with the king cost her life or can she overcome treachery and save both king and kingdom from being torn apart? Set in mythical Wales, The Footholder’s Tale, Andrew Richardson’s historical fantasy captures the mystical elements of the times and combines intrigue and classic romance, based on Celtic legends. Andrew, how did you come to write this tale? I’ve always been passionate about Welsh myths, ever since I heard them as a child. I found them absorbing, and even as a young age I appreciated their subtlety compared with the more traditional English and continental fairy tales I was used to. My all time favourite story is the tale of King Math of Gwynedd, who must keep his foot in the lap of a maiden, or he will die. That premise is unpromising, but beneath is a stunning story of love, power, and war. The story was an obvious one for me to write, and I was delighted when ‘The Footholder’s Tale’ was accepted for publication by Rebel ePublishers. I decided at an early stage of planning, that the current footholder, Goewin, would be central to my story. In the legend, Goewin eventually becomes Math’s queen. So, what do we know about her? Well, not a lot. Goewin plays a minor role in the Welsh story so isn’t really ‘fleshed out’. All we really know about her is that she was the daughter of an otherwise unknown man called Pebin from the Nantlle Valley, was a maiden (obviously), and was the most beautiful woman in Gwynedd. A few experts in Welsh literature have tried to fill in some of the void, to speculate for example that because her name means ‘strength’ she portrays the strength of womanhood. In summary, though, Goewin is a shadowy character. For a writer wanting to write her story that gave me a lot of blanks to fill in, and so a lot of mouth watering possibilities. I decided on a Goewin who was quiet on the outside – maybe even intimidated by her role amid royalty – but with an inner strength. That made her shy and insecure when she first started holding the king’s foot, but willing to stand up for herself against bullying. As her character develops and her confidence increases she gains the confidence to shape her own destiny – and at the same time, that of the kingdom. That’s enough for me in any heroine, and Goewin was a very satisfying one to write. And for anyone who has not read Andrew's work, his writing is all about those brave, intrepid heroines, this being no exception. Disclaimer: I have not received any renumeration other than an advance review copy. Thank you Carole for having me, and for your kind words. I hope 'Footy' is somewhere as near as enjoyable to read as it was to write. My pleasure, Andrew. 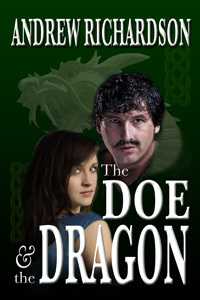 "Footy" just might unseat The Doe and The Dragon as my favorite of your novels.